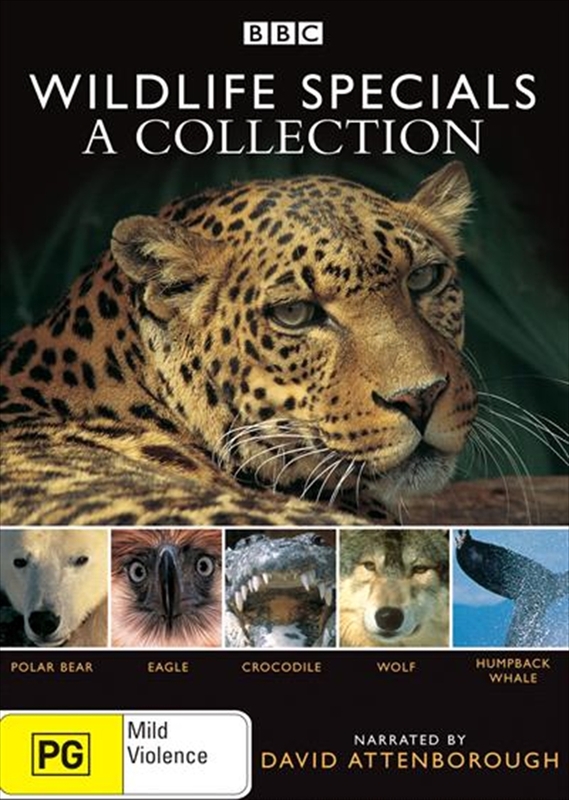 Wildlife Specials Collection, David Attenborough Documentary DVD - On Sale Now With Fast Shipping! Narrated by David Attenborough this collection of Wildlife Specials is a 2 disc set featuring six 50 min films from the world's leading natural history film makers. Each Wildlife Special uses new filming techniques and reveals new behaviours and stories: "Crocodile" reveals a killer from the dinosaur age. "Eagle" depicts these majestic birds of prey. "Leopard" shows infra red imagery night hunting. "Polar Bear" show us new born cubs. "Humpback Whale" reveals the predatory nature of this gentle giant. "Wolf" tells the story of this most persecuted animal. Extras include "Greatest Wildlife Show on Earth" & "Great Natural Wonders of the World".